A few months back a plea went out on facebook saying the MABAC league was in jeopardy as not many people had signed up for the paid event which funds the league, the Surrey Slog, and with a name like that I can’t say I’m surprised! Anyway in a moment of madness and wanting to play my part and take one for the team – I said I would sign up. After all, it was very reasonably priced and with a 2 hour cut off at 9 miles I was planning on loitering at the 8.5 mile point to complete a nice, scenic Sunday 10 miler. Easy, right? As time went by and the Slog loomed, the comments on facebook kept coming – ‘never again’, ‘feeling broken’ and ‘it’s a bit hilly’ and my confidence was waning. The realisation of what I had signed up for was well and truly sinking in. Then, on a hot and humid Sunday morning, the day of the event arrived. I was still actually quite excited by the challenge ahead and with Donna and Kellie by my side it was all going to be ok. 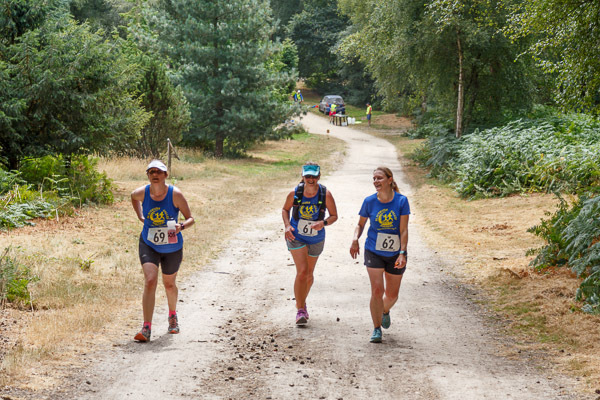 So, the three of us were off over the start line and I was blissfully unaware of what lay ahead. The first few miles were challenging but nothing we couldn’t handle and as we were the last runners, we were happy enough bumbling along, chatting and taking in the scenery. At just over 3 miles and 40 minutes later, we realised that if we were going to make the cut off we had to up our game. Having come this far we would have been disappointed at having our experience cut short. We then made good progress, pushing ourselves and greatly encouraged by the fantastic marshalls and the wonderful tail Marshall, our very own John Hogg. However, 12pm was rapidly approaching and we had a good half mile to cover in about 5 minutes. We reached the top of Holmbury Hill, where there was no time to enjoy the view and the quickest selfie in the world was taken. Not the best picture by any means but definitely one to add to the memory pile. We then had approximately 2 minutes to reach the 9 mile mark, thankfully it was downhill so we took off and found the 9 mile maker but… this was not the cut-off point, there was no one there! We continued and thankfully, a couple of hundred metres later found some very jolly marshals who confirmed we were ok to continue. Elation! We had made it and had 4 miles to cover in an hour – the pressure was off and we could relax. After a few recovery breaths and some drinks we headed out to finish our half marathon and the next couple of miles went without incident and although we were tiring we were still in good spirits. However, the combination of the midday sun, the general heat of the day and the effort I had been putting in suddenly hit me. I became light-headed and even walking was proving to be a bit challenging. The hour deadline was rapidly approaching and I was in no fit state to run anywhere. Luckily, help was at hand, Donna and Kellie were going nowhere without me and John was racing off to the next water station to bring me back a very much needed bottle of water. After almost guzzling the whole bottle in one go, we were running the last mile to the finish. I seem to recall a lot of uphill in the first few miles, so I was quite surprised when retracing our steps back to the start, found we were still going uphill! A nice downhill soon followed along with the welcome narrow track that led us to the finish. And lo and behold the light at the end of the track as we finally came out on to the main road and all joined hands for the final sprint to the finish line and to incredible cheers from our fellow BVRs who had waited to see us finish (and presumably some had been waiting a while). It was a good feeling! #loveBVR. Having set off 3 hours earlier to hopefully complete 10 miles, it was such a great sense of achievement to have actually run or rather made it round, the full half marathon. The support of everyone was just amazing – from the cheery marshalls who happily gave up another hour of their own time in allowing us to finish the whole 13.1 miles, to the front runners who praised us as they ran past (at what we worked out to be half our speed! – Incredible at the best of times let alone in those conditions) to Kellie and Donna and of course, John, who all kept me going throughout the run and the final sea of blue in our fellow BVR runners who were there to congratulate us at the end. The day was hard, hilly, challenging and at times, despondent. But, at the same time, it was great and memorable and I LOVED it! Would I do it again? Absolutely!